Born: March 31, 1862 in Pocasset Ma. Died: April 11, 1933 in Bourne Ma. at 71 yrs, 11 d.
Married (1); July 5, 1888 in Chicago Il. 1. 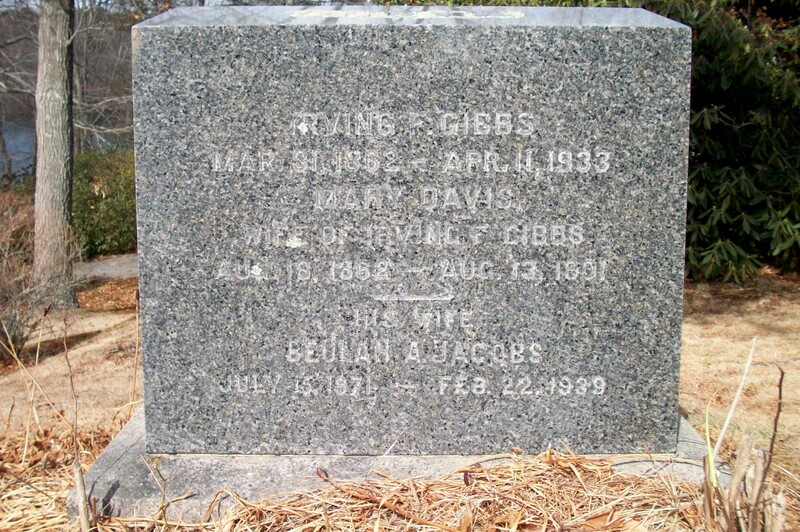 Paul Davis Gibbs; (May 15, 1889 – April 26, 1951); Married Teresa Julia Dunn (1888 – 1962) in Bourne Ma. on April 15, 1915; They had 3 children; Paul & Teresa are buried in Cataumet Cemetery. To: Beulah Alice Davis Jacobs; (1871 – 1939) (Charles L. Davis & Caroline A. Lane); Beulah married (1) Adelbert Eugene Jacobs (1864 – 1899) (John H. Jacobs & Julia Welch) in Somerville Ma. on December 18, 1866.